of the existence of Darkovice. Soon there apeared new village near Darkovice, called Žibřidovice and between them the oldest pond with mill in the county of Opava. Unfortunately after the death of the King Přemysl Otakar II the whole situation in Czech kingdom changed. During the war time Žibřidovice ceased to exist and number of inhabitants in Darkovice dropped rapidly. a part of possession of Karel z Vrbna. Against the wishes of Opavian dukes Darkovice was given to Jesuits in Opava in 1673. Their task was to perform violent recatholization. During this time there lived 27 persons in servitude; from this amount were 21 peasants and 1 independent miller. A pond and farm belonged to the Jesuits. They overburdened peasants and the result was a series of rebellions in 1734.
associated to Prussia in 1742 and the servitude was abolished in 1823 ( 25 years earlier than in the rest of the Czech Kingdom). Joy and happiness from this event was celebrated by building a chapel. Even though the village belonged to Jesuits for a long time, the school was not founded till 1867. After affixing to ČSR, area of the village was 466 ha, there lived 989 inhabitants, there were 148 houses, 3 pubs and 2 shops. 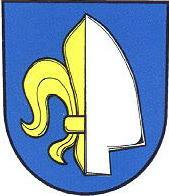 From 1979 to 1991 was the village annexed to Hlučín, but from 1991 Darkovice have been independent again. There now live 1248 inhabitants. Information from the Darkovice website (with slightly different flag).